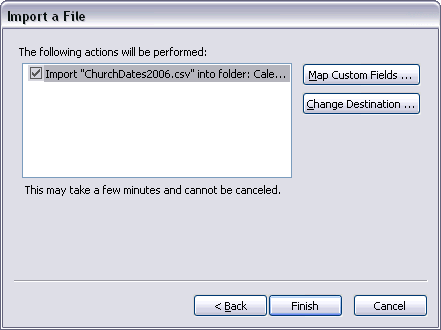 Screenshot of Outlook showing saints’ days and festivals imported into the Calendar. Better late than never! 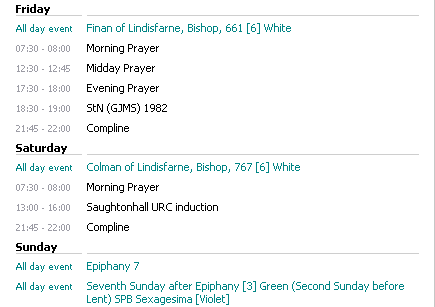 I’ve finally got around to typing up the Scottish Episcopal Church saints’ days and festivals in a format that can easily be imported into the Microsoft Office Outlook Calendar. Please feel free to download this file and follow the simple, illustrated instructions on how to import it into Microsoft Office Outlook. Illustrations: All illustrations show Microsoft Office Outlook 2003; details may vary slightly for older copies of Outlook. This does not work for Microsoft Outlook Express, which is an email application and does not offer calendar functions. Accuracy: Details are as far as possible correct, although a few errors may have crept in in the production of this file (for example in how translated (moved) minor festivals have been scheduled). It was produced for my own personal use, but I’ve also decided to release it into the public domain. Feel free to use and/or adapt it to your own use. The file can be edited in Microsoft Office Excel (or other spreadsheet, eg OpenOffice.org. Dates only: This file does not contain details of the readings for each day, only the name of the festival. 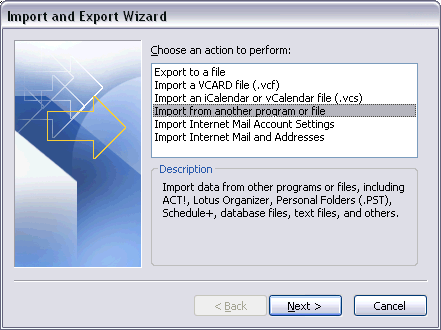 The Import and Export Wizard window will open. 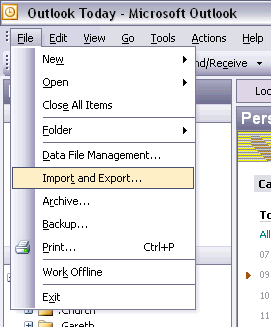 Select Import from another program or file, then click Next >. 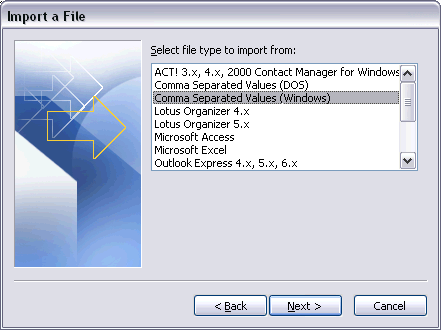 Select Comma Separated Values (Windows) from the list, and click Next >. You will now be prompted to Import a File. 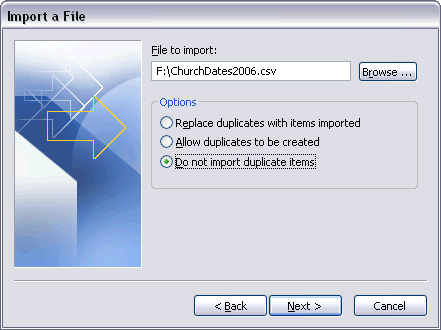 Click the Browse … button and locate the file you downloaded called ChurchDates2006.csv, once selected click Next >. 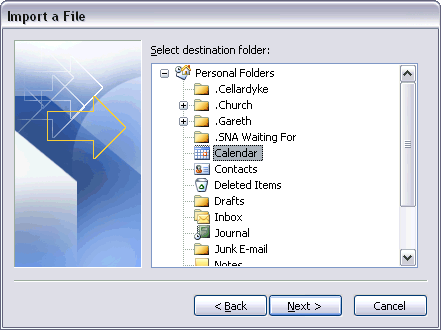 Now select the destination folder from those listed under your Outlook Personal Folders. You want to select Calendar, and then click Next >. You will be presented with a confirmation screen, similar to the one above. Make sure that the details are correct — and if you need to, check that the Map Custom Fields… settings are correct (by default, they should be). 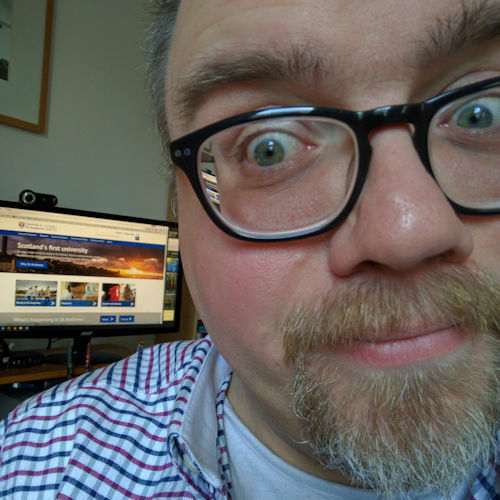 Click Finish to begin importing the details into your Outlook Calendar. Outlook will begin to import the information into your Outlook Calendar, showing you its progress (as above). 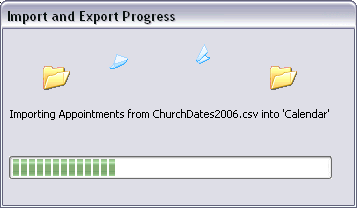 Once complete, you’ll find that details of all the Scottish Episcopal Church saints’ days, festivals and Sundays, from Advent 2005 – The Last Sunday of Pentecost (Chrirst the King) 2006, have been added as all-day events to Outlook.